I advised her that she was working through a lot of issues in her dreamtime, and if she wanted a night off to get a better rest put a selenite in her hand or in her pillowcase. She put the selenite crystal in her pillowcase and magic happened. She has a fitbit and when she checked her sleeping patterns after having the selenite close by she found that she slept through the night instead of waking up a couple of times. She had a restful night and that always makes our daytime much better! How fabulous is that! I love it when science validates magic energies! 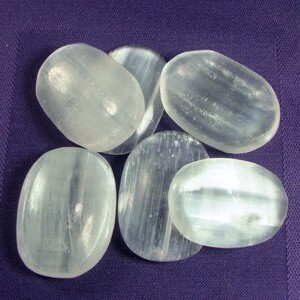 Selenite can be used to detach entities from the aura and aids in seeing the deeper picture. A selenite lamp in your home will ensure a peaceful atmosphere. I often wake up with my selenite in my hand, or other crystals that are in my pillow case. While sleeping I often grab them to maximize their healing energies, our subconscious knows what we need. What Crystals do I have in my pillow case? Selenite, Amethyst, Black Tourmaline, Snow Quartz and Rose Quartz.